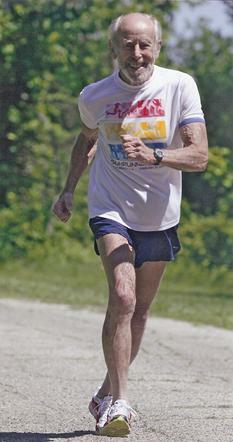 Mike Fremont, age 90, set US single-age record in Huntington Marathon, on November 11, 2012. Race results are available from the Huntington Hearld Dispatch. See what fellow marathoner and Lifenuts author, Bob Kroeger, has to say about the race and Mike. A couple years ago, I wrote an article, Aging Racefully, examining the use of age groups in races and how 5 year age groups relate to performance. The fact is, 5 year groups don't represent equal performance intervals. It's apples and oranges. This is especially true until a certain age. Then even one year makes a huge difference. What age groups should be used? See my article by clicking on Ideas on the left and download Aging Racefully. In 1992 I switched to a vegan diet. Mike has set two single-age records in 2012. On Sunday November 11, 2012, Mike ran the Huntington Marathon in 6 hours 35 minutes and 47 seconds. Mike ran the Little Miami Half Marathon in Morrow, Ohio on August 19, 2012 setting a new single-age world record, for age 90. He ran the course in 2 hours 56 minutes and 26 seconds. Mike's most recent previous record was for an 88 year old at the Cincinati Flying Pig Marathon May 2010. Mike ran that full marathon in 6:05:53. "We don't have a health care crisis, we have a public health crisis."